There are some hairstyles that never go out of fashion and look fabulous all the time. The French braid hairstyle is also one of them and always looks novel; whether worn by a small girl or a teenager or an elder woman. The twists and knots have an artful look that catch attention and make for an attractive hairstyle. It is also one of the most popular hairstyles because according to a research, the most number of video tutorials on hairstyles pertain to the French braid hairstyles. Girls and women are very curious to learn the knots and make the same on their crowning glory for a charming look. The French braid is not that difficult to make as it appears but you need to have patience to learn the same but once you have mastered the art you can give it multiple variations to bring out new hairstyles. The French braids can be also worn as an updo or a slight dash of them can be added into your loose-opened tresses. If you are curious to know about the ins and outs, then take a look at our post that has got 35 different French braid hairstyles. You are going to find all of them equally interesting. If you liked our selection, perhaps these other posts will interest you too, Rockabilly Hairstyles, Bohemian Hairstyles, Hippie Hairstyles and French Twist Hairstyle. Blonde hair styled in a loose updo with French braid pleats running on sides at the top for an artistic look. Cute hairstyle made with side parted French braid pleats ending into a free-flowing ponytail. When thick hair gets styled into French braided updo, the result is a stunning voluminous bun. The girl looks very sweet with her soft, brunette hair styled into a half loose and half tied French braid. The well-tied French braided tail looks very smart and instantly catches the attention of onlookers. This girl got a cute French braid hairstyle that partly resembles the bun and partly the tail. Side-swept French braided tail sweeping the head at the back makes for a charming portrait. Triple tails styled on the long hair of the kid and crossed to fall at back creates a lovely and fancy hairstyle. Eye-catching French braid hairstyle that is just too awesome not to get noticed; perfect for prom nights. Hair loose-opened with a side parting and graced by a French braids running sideways that looks quite graceful. The combination of blue and light brown styled into a French braided tail creates a distinct hairstyle. 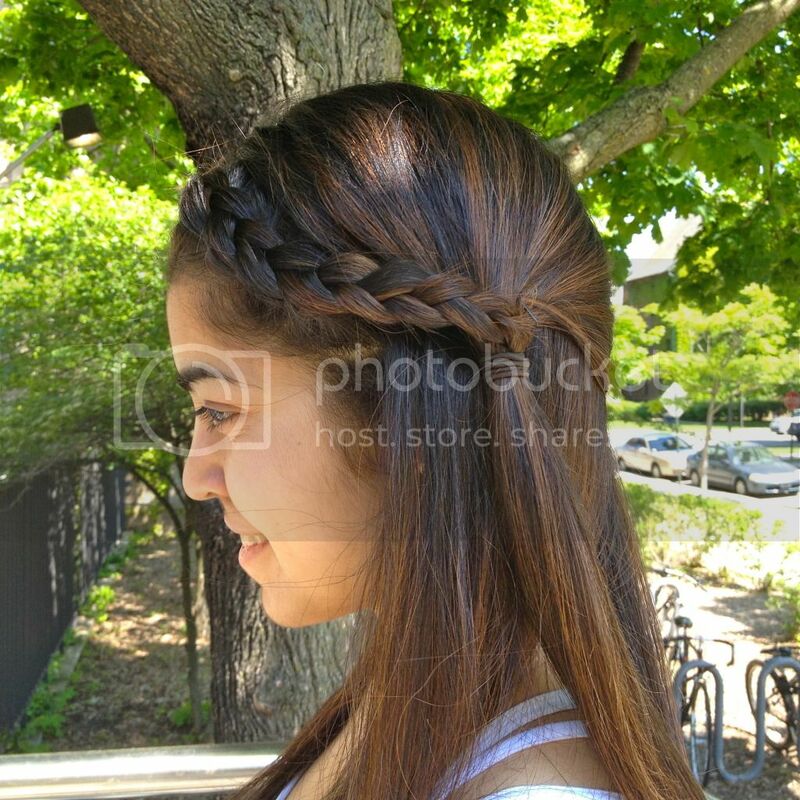 A lovely look created by tying the tresses into an artistic French braided tail on one side. The colorful tresses running into each other and styled as a refined French braided tail exhibit a striking look. The girl’s long hair knotted into a lengthy French braided tail creates a very charming look. Hair having twin shades of blonde and brown woven into a French braided tail with a puffy, back-swept front. A lovely braided tail graces the brunette tresses in the form of a hair band creating a pretty look in turn. Light blonde hair styled into a low, messy bun with French braided pleats running behind the ear. The girl has styled her dark hair in a thin French braided tail with fringes hanging along the cheeks. The artful French knots make the long hair glow with beauty and charm as is visible in this picture. Dark hair secured into a voluminous French braided bun and held with an arc shaped piece. Blonde hair styled into three French braided tails and held together with a clutcher into a bun. The circular furrows running into French knots create an attractive looking hairstyle. The cute little kid looks more charming in her long, twin braided tails down with a center parting and hanging on back. This is an awesome hairstyle that looks quite artistic and very exclusive with the knotted, spiralling braids. The girl has got a unique French braid hairstyle with knots gracing the dark mane on front and back. Medium length blonde hair styled into a neat and charming French braided tail that looks pretty. Blonde hair styled with a side parted French braided tail that further runs into a long tail at the back. Thin French pleats done on front and thicker one on sides create a super cute look for the girl. The girl’s thick hair, when get knotted into a French braided tail, look very bewitching. Dark hair tied in tight French braided tails with a center parting and secured into a bun at the back. The thick strands provide the best platform for a French braided tail and here one can witness the same. Jet black, shining and smooth hair secured into a French braided tail that looks marvelous. Dark hair secured into a French braided tail encircling the head and ending into ponytail with straight layers spread at back. Golden blonde hair styled with middle parting and done into French braided tails starting from front. 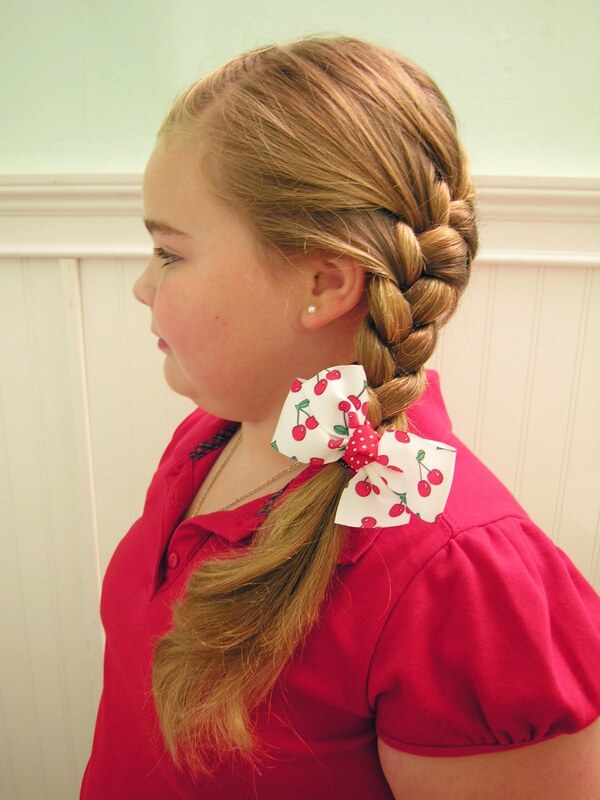 The chubby girl in her middle parted hair secured into two braided tails and decorated with a cute bow looks very cuddlesome.